Every day we see you, our customers, pushing the boundaries of availability, performance and scalability. We hear you asking not just for the ability to scale two times, five times, but 10 times and 100 times instantly, without sacrificing performance or security. These same needs arose in Microsoft’s own cloud journey over the last 10 years and led us to build large, enterprise grade network and application infrastructure to solve reliability, scalability, performance and agility problems across Microsoft. Solving these enterprise-grade challenges for both consumer and enterprise services from Bing, Office, Skype, Azure, etc. led to developing unique infrastructure and services, battle-tested by years of constant support for Microsoft’s largest businesses. Today, we are excited to bring one of these enterprise-grade services to you as we announce the public preview of our newest addition to the Azure Networking and Azure’s application delivery suite of products, Azure Front Door Service. This service, your application’s new Front Door, is a secure and highly available entry point for delivering your high performance global hyperscale apps. Front Door provides your web and mobile applications, APIs, and/or cloud services with always-on reliability, high performance, easy scalability and simplified connectivity. Deployed to the edge of Microsoft’s global network, Front Door gets your application delivery story right to the doorstep of your users. Application acceleration with anycast and using Microsoft’s massive private global network to directly connect to your Azure deployed backends means your app runs with lower latency and higher throughput to your end users. HTTP load balancing enables you to build your application resiliently across regions, fail-over instantly and offer your users an “always-on” web site availability experience. Path based routing powers your global microservice applications with independent routing all under your single global domain. A single pane of glass to monitor and gain insight into your user’s traffic and your distributed backend service’s health. IPv6, custom SSL certs, rate limiting, and a myriad of features provides the customizability to enable you to suit your application’s core needs. 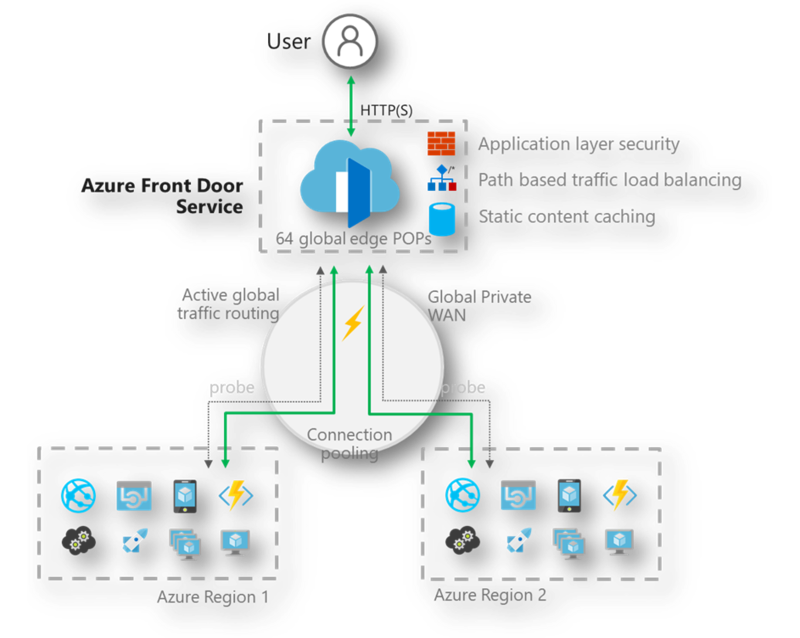 Whether you’re migrating a global website to Azure, building a modern application from scratch or just promoting your small business, along with the rest of Azure’s application delivery suite of products Traffic Manager, Application Gateway, Load Balancer, Azure CDN, and now the Azure Front Door Service. We provide you the tools you need to build world-class applications with Azure. We’ve been working on Azure Front Door Service for the past 5 years plus, and over that time it has changed Microsoft’s services and significantly simplified the devops processes and site reliability engineering playbook for many teams. With this release we’re really excited to finally bring this essential component of Microsoft’s own cloud story to you. I encourage you to try out Azure Front Door Service today, we’re looking forward to seeing the great and powerful applications you build with it. Get started with the Azure Front Door Service today! If you are interested in exploring capabilities beyond the standard offering, simply file a feature request on our UserVoice page or feel free to contact us at afdfeedback@microsoft.com.